« Are Cleveland and Cincinnati different? 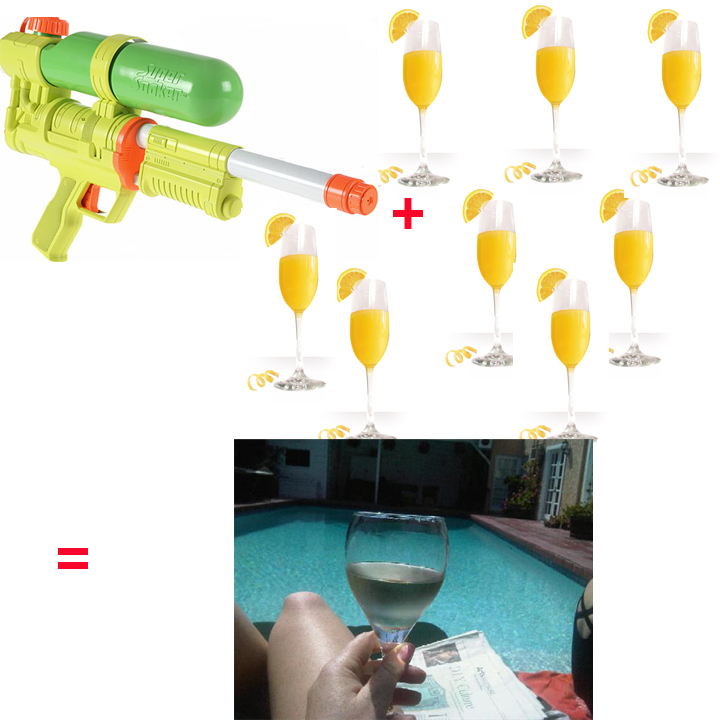 All I want in life this Sunday is to sit by a pool and have someone bring me bottomless mimosas…for like $20. Is that so much to ask? I would settle for being at a hotel that had a pool, indulging in said $20 bottomless mimosas (And BTdubs, I’m being generous with the $20. I typically pay between $9 and $13 for my bottomless mimosas, but I’m willing to add the ++ for this fantasy). There is nothing better than an afternoon of bottomless mimosas, and then dipping into the shallow end of a pool where the water friction (or whatever it is that makes old people do aerobics in the pool) keeps me standing. Is that possible? With a heavy heart, I admit I can’t give a good answer for this one. Although not a GOOD alternative by any means, I think the best of this worst situation involves just regular bottomless mimosas and a squirt gun. Maybe a super soaker. Even that only brings it to the level of white wine by the pool. This entry was posted on October 1, 2010 at 8:27 pm and is filed under Uncategorized. You can follow any responses to this entry through the RSS 2.0 feed. You can leave a response, or trackback from your own site. I know how you feel. The other day my Butler sprained his ankle and I had to answer the phone myself. It was horrible.